Acer didn’t embrace Microsoft’s Windows Phone 8.1 OS for smartphones, but it’s really warming up to Windows 10. The Taiwanese company plans to launch more Windows 10 smartphones as it looks to bring a consistent user experience across its phones, tablets and PCs, said Wahid Razali, marketing manager for Acer in Europe, at the Mobile World Congress trade show in Barcelona. Unlike its predecessor, the new OS makes it easier to share content and use the same applications across the range of Windows devices. Acer has mainly offered Android smartphones in the past, but Windows 10 has made it rethink that strategy. It’s one of the only PC makers that can offer Windows on tablets, laptops and smartphones, which makes adoption of the OS on handsets an easy decision, Razali said. 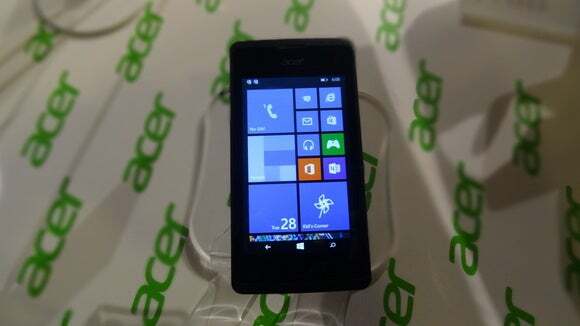 However, Acer’s first Windows handset, announced on Sunday, uses Windows Phone 8.1. The Liquid M220, priced starting at $89, is a 3G smartphone that can be upgraded to Windows 10 when the OS is released by Microsoft later this year. The phone has a 4-inch screen, 4GB of storage, 512MB of RAM and two SIM slots. Acer will offer Windows 10 handsets in a range of price points and screen sizes, Razali said. The company did not provide a timeline for those plans, but devices could come later this year. Other companies making handsets with Windows Phone include HTC, Samsung and Microsoft’s Nokia unit.